That bubbly you toast with on New Year’s Eve (or any toastable occasion, like finishing a work week without crying more than four times) could be in danger: France is reporting its lowest champagne harvest in 40 years, after vineyards were severely damaged by hailstorms, wet weather and fungus. This year’s holiday season probably won’t be affected, as the fizzy stuff usually ages at least 15 months before it’s guzzled, but this is still a big hit to France’s champagne producers, and is especially hard-hitting in the midst of the European economic crisis, reports Bloomberg News. There’s actually enough champagne to last three years, sitting safely and awaiting bottling in producers’ vats. 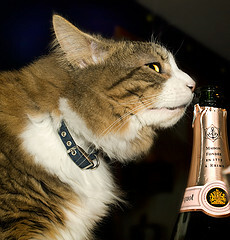 The bubbly is usually made up from a mixture of more than one year’s harvest of grapes. “We built up reserves during the years when we had big harvests, which helps us deal with the caprices of nature,” said a spokesman for the French champagne producers association. The other problem, however, is that the French aren’t drinking as much champagne as they used to and they account for about half of global sales. At first it was just a temporary dip, but now that the crisis in Europe has settled in, “France is not really in a festive mood,” said one expert. You know what that means, guys. We’ve got to pick up the slack — even if it’s the cheapest bottle you can find, drink it for France.